Flavor Profile: Smooth and buttery with an underlying sweetness. A remarkably unique finish! Seed is started in a solar powered upweller, suspended from a rafter for 12 months, and then spread on bottom for another 12 months. Harvested by diver or rake. Time to market: 2 years. 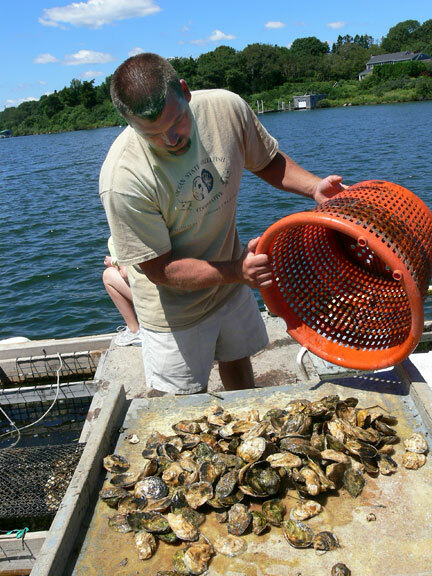 After earning a Bachelor’s Degree in Environmental Science and Biology from Springfield College in Massachusetts, Rob Krause moved to Rhode Island with plans to start an oyster farm. He took graduate courses in Aquaculture at the University of Rhode Island and during this time, he worked on Moonstone Oyster Farm with John West, who now owns and runs the Cedar Island Oyster Farm with his wife Cindy. The two worked together for six years, and now as owners of independent farms and both members of the Ocean State Shellfish Cooperative, remain close friends.